Drilled Uncompleted Wells (DUCs) are reaching record levels according to the EIA. 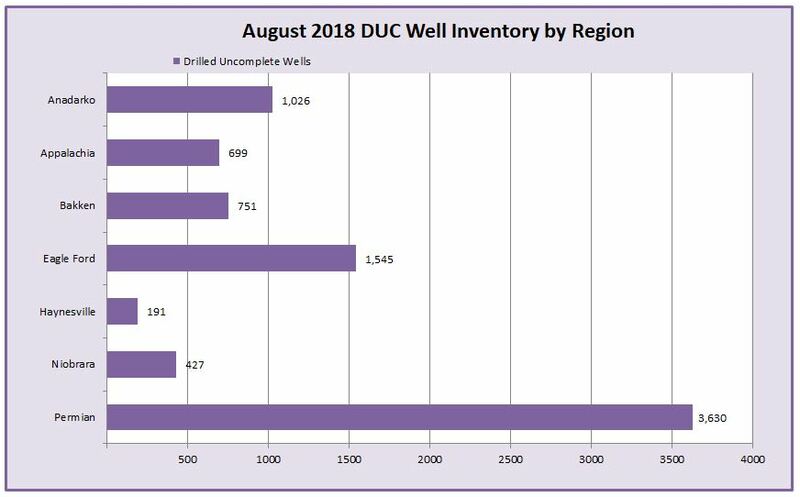 August of 2018 added another 238 DUC wells in the major basins to reach a record 8,269 drilled uncompleted wells in inventory in the United States. The Permian Basin leads the pack with 3,630 DUC wells at the end of August, followed by the Eagle Ford Shale play with 1,545. The Anadarko region also added 103 DUC wells between the end of July 2018 and the end of August. Why the Increase of DUC Wells? Why are we seeing such an increase in drilled uncompleted wells? One of the main reasons for the increase of DUC wells in the Permian Basin region is take-away capacity. There simply is not enough pipeline capacity to transport crude from the region to refineries along the gulf coast or export hubs in the Houston ship channel and ports in Corpus Christi. However, there are numerous new pipeline projects and capacity expansions underway to help alleviate the problem. Gary Willingham, executive vice president of operations for Noble said on a recent company earnings call, “Our decision to moderate some of our completion activity in the near term aligns with the timing of additional takeaway capacity later next year.” This same logic was used by many Permian operators in planning their completion activity over the next several years. Another possible reason for the increase in DUC wells is the Brent/WTI price spread. Currently, WTI is trading at about a $10 discount to Brent crude. Some predict that the spread may reach as high as $15 a barrel until new pipeline capacity comes online. Once the new pipeline projects come online in 2019, the Brent/WTI spread is expected to narrow rapidly. What does this mean for the frac sand industry? Knowing what the current DUC well inventories are and by studying the trends, frac sand companies are able to better estimate demand, which sets the tone for planning for production ramp-up without oversaturating the market. In 2017, an estimated 50 billion pounds of frac sand was used in the Permian Basin alone, and that figure is expected to reach nearly 120 billion pounds of frac sand in only five years. North American frac sand demand is expected to reach an estimated 231 billion pounds, of which more than half is expected to be used in the Permian Basin. HIS Market released a report earlier this year stating that the current market value for frac sand exceeds $4 billion in 2018 and is expected to grow another 50% by 2023, reaching somewhere around $6 billion. Compare that to the market value of proppant sand in 2016, which was $1.3 billion. By 2020, three shale plays are forecasted to account for 75% of all U.S. frac sand demand – the Permian Basin, Eagle Ford, and Appalachia. The Permian Basin currently has around 3.1 million barrels per day of takeaway capacity and around 300,000 barrels per day of local refining capacity. However, Permian crude production has exceeded 3.4 million barrels per day each month since July of this year, thus producing pipeline bottlenecks. Now there are new crude oil pipeline projects and existing pipeline expansions underway in the Permian Basin that will more than double the current takeaway capacity. This additional takeaway capacity in the Permian Basin could unleash crude production and reach highs never seen before in the United States, and possibly the world, with DUC wells coming online combined with existing and new production. The benefits of this increased capacity and crude production are strikingly obvious for the frac sand industry. Frac sand companies that had the foresight to strategically position themselves in the major shale basins to provide in-basin sand are set to reap the rewards of “Shale 3.0” which could potentially dwarf previous shale booms.